For me, Abbot Kinney Blvd is a street that just happens to be in Venice Beach, it’s not necessarily ‘of’ Venice Beach. Today, Venice is mostly known for it’s circus-like Ocean Front Walk, a promenade that features street performers, fortune-tellers, artists, and all-around interesting people. Abbot Kinney has slowly become its own brand by adding hip clothing shops, upscale restaurants, and holding monthly food events. Pork Belly’s may not be an upscale restaurant but it certainly adds an exciting new element to the ever-growing food scene that has taken over the street. Owner Jon Swire shoveled out a smorgasbord of succulent meat accompanied by side dishes that were equally as good. I could be extremely biased here since Jon and I are both New Jersey natives from neighboring towns but fair and balanced I shall be. Sweet pickles, lightly fried, were the perfect complement to the fatty pork belly. A sweet and salty combination which proved to be a culinary match made in heaven. Pork Belly’s sweet potato tots were not only fried to perfection but were delicious and weren’t greasy whatsoever. I might even take a blind leap and consider it health food but I have always been an optimist in that regard. Forgive me for jumping right into the side dishes at Pork Belly’s because we all know why we would brave the Los Angeles traffic and the unforgiving Valley heat to visit the West Side; and that reason is pork. 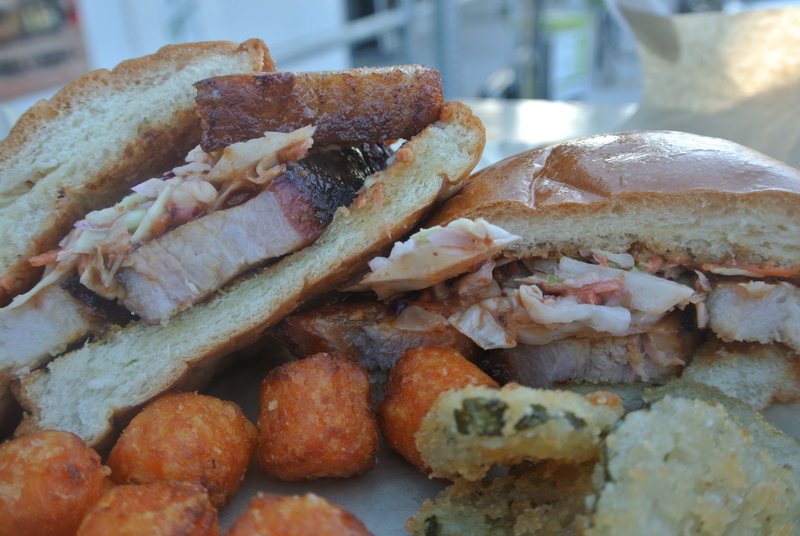 The first sandwich we tried was the “Belly Up” which is their slow roasted pork belly topped with their homemade bbq sauce and coleslaw on a brioche bun. 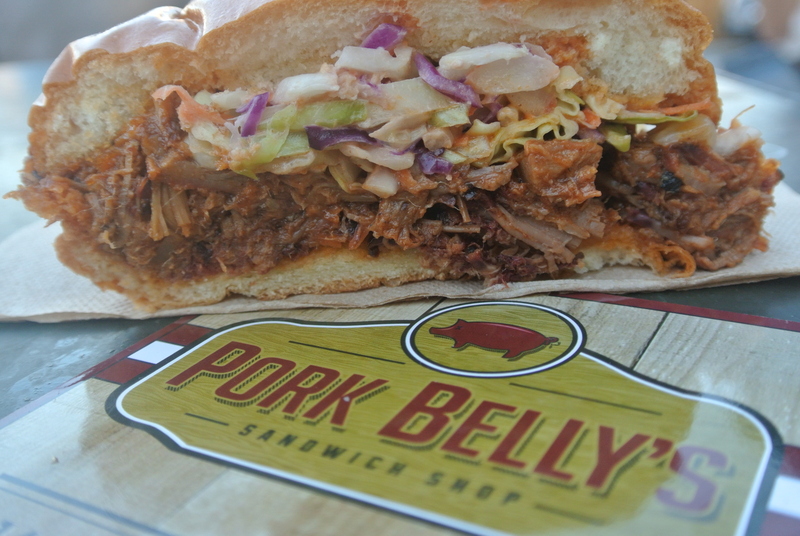 Their bbq sauce is delicious and is a personal recipe that is exclusive to Pork Belly’s. I compared it slightly to a Kansas City style with a lot of sweet and tangy flavors but lacked a big spice component. Another sandwich we indulged in was The Chop, which is their 12-hour smoked brisket topped with their homemade bbq sauce and coleslaw on a brioche bun. I know pork belly is the star of the show here but the brisket blew me away. The brisket and bbq sauce tie together perfectly on this sandwich and if I wasn’t so full I would have ordered a second just for the sake of it. The dessert menu is very extensive, you have the choice between a small or large chocolate chip cookie so don’t hurt yourself while deciding. *Spoiler Alert* Each sandwich comes with a hidden chocolate chip cookie inside. 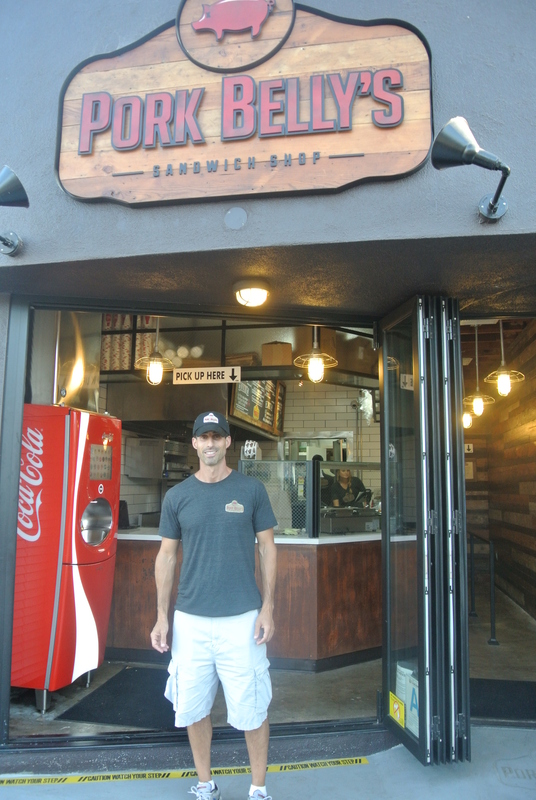 There isn’t a doubt in my mind that I will be visiting Pork Belly’s in the very near future. If you are a fan of dining al fresco – and you would have to be to dine here – this is the place for you. Order at the counter and belly up at table top out front for serious people watching.